I recently purchased these boots second hand off ebay, after the straps on my old Hein Gericke Bullson boots started to wear and looked ready to snap at any moment. I opted for Alpinestars as I’ve always found their gear to be good quality. It’s easy to see why they’re still going strong after recently celebrating their 50th anniversary. Granted their brand carries a premium price, but popularity does mean a large number of their products can be found second hand and so with a little patience, some real bargains can be found. 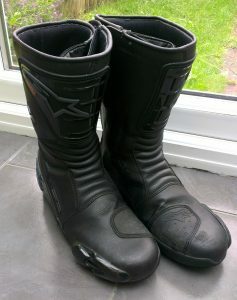 These S-MX 4 boots will normally set you back in the region of £150, but I picked up a pair in good nick for just £40. Sorted. So, on with the review. The first thing that struck me about these boots was the construction and solid protection they provide. The panels of solid plastic around the heel and calf, armour covering the ankle bone, tow sliders, gear change re-enforcement on toes and generally thicker and more heavyweight leather throughout. My old Hein Gericke boots seem positively featherweight in comparison. 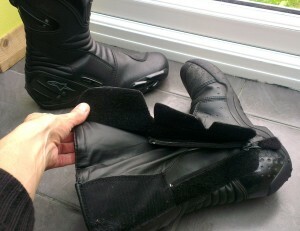 Fastening of the boots is via a zip on the inside of the boot, with three Velcro flaps that pull over the top of this. Cleverly the pull tag on the zip is also Velcro so sticks to the boot, preventing it coming unzipped or getting in the way. Behind the zip is a waterproof panel that folds flat against your leg. This ensures no water can get in through via the zip. The zip can sometimes be tight to pull up, but angling your toes upwards tends to line it up better making it easier to pull up. The Velcro flaps then just take seconds to stick down. Once on your feet the S-MX4 boots are very comfortable. Mine are a EUR Size 45 (UK 10.5). I normally wear a size 11 Converse, but have narrow feet. These fit well width wise, but I can sometimes just feel the end with my toes. On the bike the heavier weight leather took a little while to get used to, I could feel gear changing so well. But after a few days I soon got used to it and the extra protection certainly provides greater peace of mind. The boots have far less flexibility compared to my old ones, but this only proved tiresome when covering the back brake for extended filtering runs. In the wet, the boots have held up fine. No issues, no leaks. Although when it really hammers it down I do wear waterproof over trousers which go over my boots to prevent water running down my leg into them. I haven’t experienced very cold weather in them, but so far, my feet have been plenty toasty, but conversely not overly hot on good days. One complaint is the soles. I find they don’t afford as much grip on the floor as my old Hein Gericke boots did. No problem in dry weather, but in the wet, one does have to take care. A couple of times my feet slipped a little causing me to nearly drop the bike whilst I was walking it along wet paving slabs. The boots are second hand, but the soles have very little visible wear, so I suspect a brand new pair wouldn’t be much better. My second complaint is the size of the boots around the calves. They’re took big to pull jeans over and wear casually during my day at the office! Thus I now have to pack a change of workplace footwear. Overall, I’m very pleased with the boots. The extra protection is definitely a big plus point. Their comfortable and are holding up against the elements well. For the second hand price I paid, I couldn’t ask for more. Whether they’re worth the £150 brand new price tag; I still think they’re good value, especially compared to the £80 Hein Gericke Bullson boots. 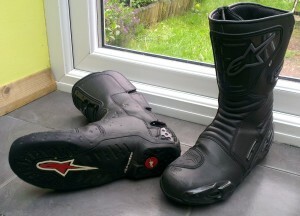 Buy brand new Alpinestars boots from SportsBikeShop (UK). Buy brand new Alpinestars boots from Get Geared (UK).